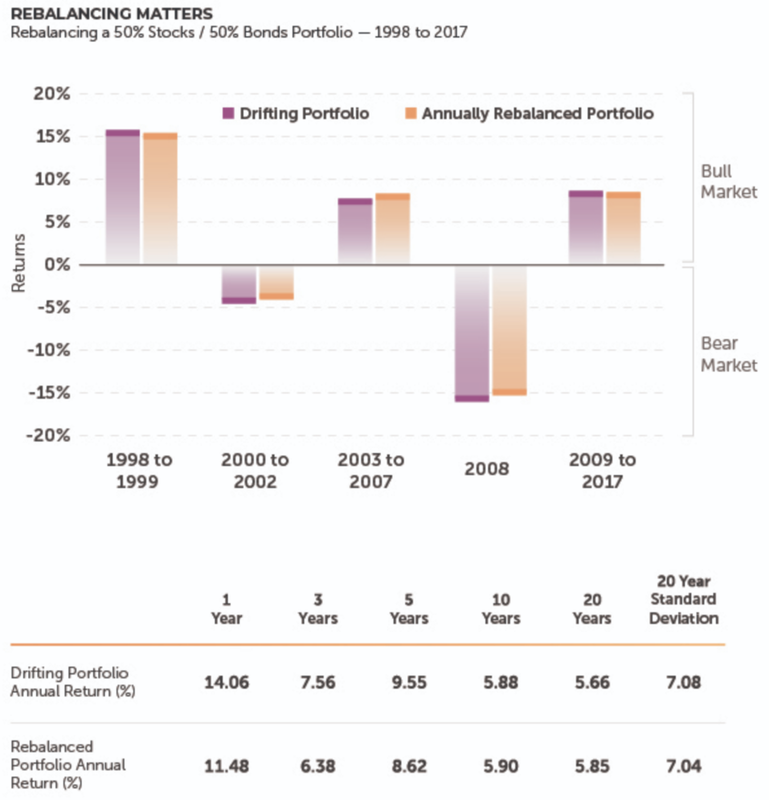 Rebalancing your portfolio is an important step that many people neglect when they try to manage their own investments. Rebalancing helps keep your portfolio allocated in line with your desired mix of stocks and bonds (and the other factors of return, such as small and value), by taking money from assets that have performed well and reinvesting in assets that haven’t. Without rebalancing, your portfolio can drift from one level of risk to another as markets change. This drift can add extra unintended or unexpected risk to your plan. Rebalancing is part of our Design, Build, Protect process (watch this 3-minute video). In the chart below, you can see that the annually-rebalanced portfolio experienced fewer ups and downs over the last 20 years. It may not have soared as high during bull markets, but it didn’t decline as much during bear markets. And overall, it offered slightly better performance and less volatility than a drifting, un-rebalanced portfolio. Data Source: Return 2.0 Past performance is no indication of future results. Stocks are represented by the S&P 500 Index. The S&P 500 is an index of 500 stocks chosen for market size, liquidity and industry grouping, among other factors. The S&P 500 is designed to be a leading indicator of U.S. equities and is meant to reflect the risk/return characteristics of the large cap universe. The SBBI Long Term Bond Index is comprised of the total return on 20-Year US Government bonds. Underlying data is from the Stocks, Bonds, Bills, and Inflation® (SBBI®) Yearbook by Roger G. Ibbotson and Rex Sinquefield, updated annually. Bonds are represented by the SBBI Long-Term Bond Index. Indexes are unmanaged baskets of securities in which investors cannot invest and do not reflect the payment of advisory fees associated with a mutual fund or separate account. Returns assume dividend and capital gain reinvestment. Stock investing involves risks, including increased volatility (up and down movement in the value of your assets) and loss of principal. Bonds are subject to market and interest rate risk. Bond values will decline as interest rates rise, issuer’s creditworthiness declines, and are subject to availability and changes in price. Rebalancing will not benefit your portfolio every time or in every market environment, but diligent rebalancing on a set schedule can help ensure that you aren’t taking less, or more, risk than you are comfortable with. Rebalancing does not guarantee a return or protect against a loss. The buying and selling of securities for the purpose of rebalancing may have adverse tax consequences.